Chinese President Xi Jinping welcomes U.S. President Donald Trump to Beijing, November 9, 2017. In fact, the United States ended up worse off by the end of Trump’s Asia trip, mostly because of Trump’s performance in China. Asia’s most populous country, with its largest economy and most powerful military, China is the only country Trump visited that seeks to offer an illiberal alternative to U.S.-style open, law-based governance for other countries to adopt. Yet in unscripted remarks online and off, the U.S. president could not hide his fondness for China’s unelected authoritarian ruler, Xi Jinping, one who is building an ever-more-alarming cult of personality and moving his government ever further from the kind of partner that the United States should wish to have. Shortly before his trip East, Trump praised Xi’s “extraordinary elevation” on Twitter and appeared to refer to the Communist Party General Secretary as a “king” during a Fox interview. Then, while in Beijing, Trump took to Twitter again to call Xi a “representative of his people” and in comments to the press, referred repeatedly to their “chemistry” and “warm” feelings. Trump’s comments came at a particularly opportune time for Beijing. Xi has just been given a second five-year term running the country, and “Xi Jinping thought” has recently become enshrined in China’s constitution, making it essentially heretical to question him. In Chinese media and on Chinese streets, airbrushed images of Xi proliferate and loom ever larger. Parts of China, particularly Xinjiang, are sliding ever further toward something like totalitarian rule. These events mean that nods of approval and disapproval from the American president matter more than ever. It is common enough for an American president to speak of “friendship” with China, and Trump may have thought he was cultivating Xi, not the other way around. The danger is that Trump’s particular choice of words, which he may have considered merely flattering, likely registered among Chinese officials as a specific endorsement of Beijing’s repressive mode of governance. China’s government has long openly pined for its system of governance to be seen as a full-fledged equal to the United States. Beijing argues that its dictatorship is a different but equally valid road to travel, one that has been made with the implicit consent of its people. Trump just appeared to confirm it. Trump has made clear that he views the gaudy receptions he received in Asia—mostly from allies terrified of abandonment and from a China determined to butter him up—as part of an outpouring of respect. But Trump’s effort to distinguish himself from his predecessor belies reality. It can be hard in China, particularly as a high-profile visitor, to tell flattery from respect. Doing so requires country-specific knowledge, discernment, and sometimes moral courage. Trump seemed to have been dazzled by China’s combined display of hospitality and power, let his guard down, and failed to make the distinction. In that regard, no matter how lavish and expensive the reception, it marks a cheap price for acquiescence to China’s authoritarian model of governance. It’s possible that Trump genuinely thinks that he and Xi have a “great relationship” and are, in fact, friends. 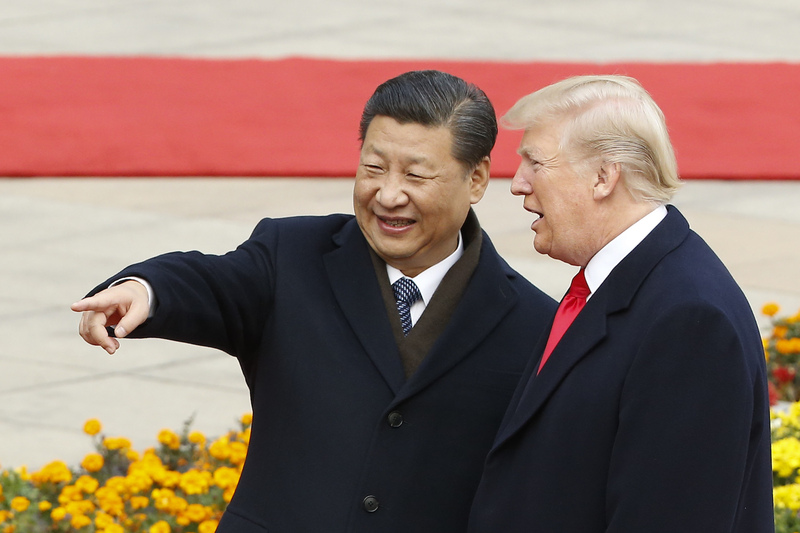 If so, Trump is buying into a Chinese bureaucrat’s highly problematic definition of “friendship.” As James Palmer and I wrote last year, Chinese bureaucrats often claim speedy friendship to flatter and disarm unwary foreigners. Meanwhile, the foreigner, who may be falling short of his or her diplomatic or professional goals in China, holds out the declarations of affection as proof that something valuable is being accumulated. Often, their collective value is nil—the friendship is gossamer-thin, and sometimes short-lived. Beijing always engages in some type of informational gamesmanship. But it’s never before had a willing accomplice in the American president. The Trump White House released a slick video of his visit showing sweeping red carpets, seas of jumping children holding the two nations’ flags, and a goose-stepping honor guard. The self-congratulations were redolent of a bureaucrat’s kid-glove treatment in Chinese media, where showing up, shaking hands, and being thoroughly feted score as ipso facto victories, somehow transmogrifying the gaudy trappings of power into their own justifications. For the first time, an American president’s vision of himself sat uncomfortably close to the Communist Party’s depiction of itself. The tonal turnabout should astonish Trump supporters who took him at his word when he said he’d get tough on China. But perhaps this should not surprise. Appearances are what matter to the President, and in that regard he has an ally in the modern Internet, where images and videos are now worth at least a few thousand words, and social media provides the simulacrum of transparency and intimacy. This may explain why outlets like Breitbart, which some predicted would take an anti-Trump turn following Steve Bannon’s ouster from the White House and return to the publication as executive chairman, seemed equally lost in the pageantry, giving Trump soft coverage that oohed-and ahhed at mostly meaningless elements like First Lady Melania Trump’s couture. It is, of course, part of any U.S. President’s job to be diplomatic with world leaders. But the President is also supposed to deliver unwelcome messages to foreign governments that have proven enduringly hostile to American values and interests. Some analysts posit that Trump is, at some indefinite point in the future, going to get tough on China again, the implication being that he can trade the promise of continuing silence on virtually every question touching global values and human rights for better treatment in bilateral trade and more action to halt or slow North Korea’s nuclear program. But it’s not possible to reconcile Trump’s obsequiousness toward Xi with his other stated goals. Trump has already given away some of the most valuable goods in the store, and it’s not clear he got much of substance in return. There is an old saying in Chinese: “Once a word leaves the lips, four horses can’t chase it down.” It means that what’s said can’t be unsaid. Trump’s signal to Beijing—a nod, a whisper—need only come once. It will be far harder to take it all back.